glimp has been created to help Kiwi's compare, switch and save. 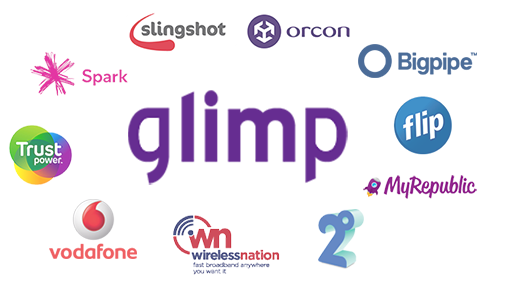 Use glimp to compare the best broadband providers and plans by price, speed, data and more. You can also use glimp to compare power companies and plans by price and their benefits. glimp is 100% independent, which means we’re not owned by any company. Our independence means we’re free to focus our energy and efforts on serving you, our customers. glimp is 100% free-to-consumer, which means you don't have to worry about being charged by us. Use us to compare services as many times as you like. We constantly update and improve glimp to make sure that it is accurate and easy to use. We want to make sure you understand how we make money. The companies you see on glimp pay us a conversion fee when you choose them on our site and sign up to them. This allows us to keep our service running, always improving in ways of saving you time and money and growing as a business. The fee we charge is smaller than the costs companies incur through advertising on TV, social media or other channels. This is why so many choose to work with us. We are on mission of saving our customers time and money. While we are trying to achieve our mission we also aim to provide the best service possible. We know managing things like broadband and power can be very tedius. We are here to do all the hard work for you so you can spend more time on things that matter. In less than a minute, you can choose yourself a new provider, product or service and begin saving. We are the best at what we do and that is finding you the best deal as quickly and simply as possible. Here at glimp we ask you few questions, so that we can tailor the results we show. Why? So you can easily compare and find the right product or service for you. Can't find what you were looking for or have any questions? Our friendly glimp team will be happy to help you out! glimp became a reality after two guys, Michael & Denis, decided to change their lives. With enough savings, they both decided to quit their jobs in June 2015 and focus all their time and effort on glimp. The idea for glimp originated in Michael's head ever since he came to New Zealand. Michael & Denis met each other in July 2015 and only in September 2015, they started working on glimp. Through the combined effort, glimp was launched in January 2016 with broadband comparison as our first product. Now, in June 2016, power comparison has joined glimp. Still living off our savings, we are working hard to make glimp a part of New Zealand households. We are very humbled to have you as our customer and it means the world to us. Helping Kiwis is what is driving us. We hope you enjoy glimp!